This solar-powered retreat in Northern California's Sonoma wine region was designed by US firm Turnbull Griffin Haesloop Architects to include outdoor living areas and framed views of the landscape. 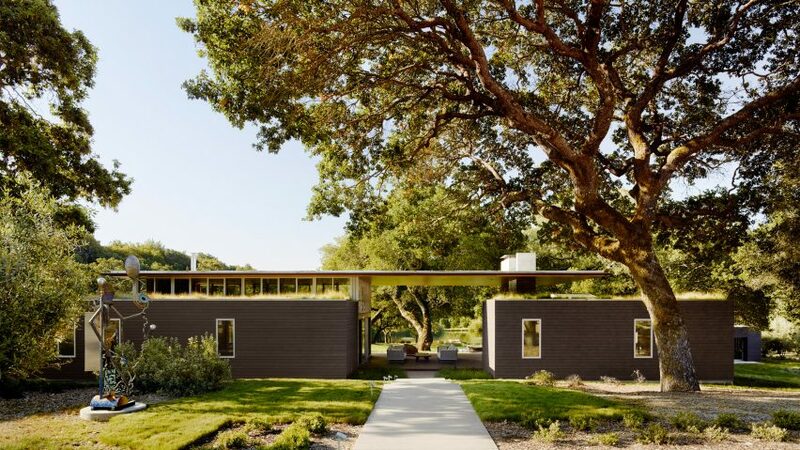 The Sonoma Residence is situated on a lush meadow dotted with large oak trees. The site gently slopes down toward a spring-fed pond. The owners requested that the residence be suitable for outdoor living during the summer months, with easy access to the pond and a swimming pool. Providing views of the scenic terrain was also a key factor. "The design frames the verdant oak meadow and pond within the larger landscape," said Turnbull Griffin Haesloop Architects, a San Francisco-based studio. 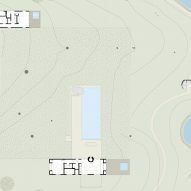 The property encompasses a main home, a pool house and a detached garage – all low-slung, rectilinear volumes nestled into the landscape. Board-formed concrete, stucco and cedar were used for exterior walls. The 2,950-square-foot (274-square-metre) main dwelling comprises a series of bars and boxes of varying heights, including an open-air volume that serves as an outdoor living room. A thin plane stretches over the central portion of the home. "A thin, floating roof reaches across the primary outdoor living space to frame the entry and create a dramatic threshold from the car court to the pond beyond," the architects said. 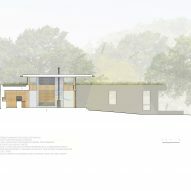 Lower volumes are topped with landscaped roofs – their greenery visually linking the house to the surrounding landscape. Inside, the home is fitted with Douglas fir cabinetry and concrete flooring. Ample glazing and sliding glass doors provide a strong connection to the outdoors. The open-plan living and dining area is wrapped with clerestory windows, which bring soft, natural light into the space. The pool house, which encompasses 840 square feet (78 square metres), contains a changing room, a guest room and a playroom, along with areas for storage. An expansive terrace is shaded by a trellis-like canopy, and serves as a comfortable area for eating and relaxing. A small dock for kayaks juts into the pond and a seating area around a fire pit is situated close by. These elements further extend "the outdoor living experience", the team added. The net-zero home is designed to produce as much energy as it consumes. The architects utilised a number of passive cooling strategies to reduce energy usage, including heavy insulation, operable windows and deep roof overhangs. These elements "allow the house to remain comfortable without the use of air conditioning". Electricity is generated via solar panels. Photovoltaic-powered heat pumps warm the water that is circulated through the home’s in-slab radiant heating system. The pool water is also heated via solar panels. Known for its scenic terrain and rich agricultural heritage, the Sonoma region is a popular area for distinctive country homes. 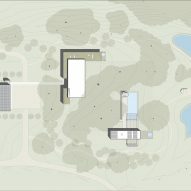 Other projects in the area include a white dwelling by Turnbull Griffin Haesloop Architects that was inspired by traditional barns, and an off-the-grid compound by Malcolm Davis that consists of rustic volumes clad in weathering steel.